The Dashboard allows you to easily change the sort order of values within a dashboard item. You can also enable sorting by parameter values. The sort order of dimension values is indicated with an arrow. 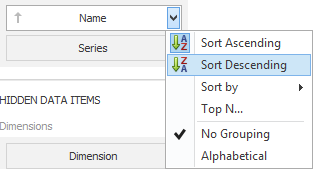 To change the sort order in the Designer, click the data item. You can also toggle sorting from the data item menu. Dashboard allows you to sort dimension values by a specific parameter represented by a measure. To enable sorting by measure in the Designer, use the Sort by submenu in the dimension's menu. You can also sort dimension values by values of hidden measures, see Hidden data items. Sorting - InLoox • Copyright 1999-2019 © InLoox, Inc. All rights reserved.